This is now the sixth iteration of Corporate Knights’ sustainable cities ranking, and the first one to attempt a direct comparison between Canadian and US urban areas. 20 cities were chosen and assessed against 27 indicators in 5 categories that since 2009 have represented our best attempt to measure sustainability the Corporate Knights way: along the social, environmental and economic pillars. Roughly half of the indicators were carried over from the 2011 rankings, a core of traditional measures (such as air pollution, household spending on shelter, population density, education) that we felt we could not do without. There are several things that changed this time around, other than the inclusion of US cities. One change is the breadth of sources collected to serve an international ranking, including international reports from the World Bank, WHO, in addition to heavy reliance on both countries’ national statistics. Another change is a slight shift away from goal or vision-oriented indicators, towards measuring recent infrastructure and socio-technological change. We have incorporated new metrics like congestion and “walkability”, as well as cycling infrastructure, believing these affect citizens’ quality of life as well as economic and environmental performance of cities. And finally the ranking was not done with benchmarks or targets for which more than one city could get a perfect score. Our focus this year was purely on rankings, meaning no two cities could get the same score on any indicator. While making it impossible to interpret scores as good or bad, we can have a precise and accurate measure of cities performance relative to each other, a benefit that allows careful comparison of Canadian and US cities in this issue. Sustainability – What are we measuring? Sustainability is a term most people have difficulty defining, much less measuring, so we had to let go of the idea that we are measuring it directly. There are three main concepts of sustainability deriving from the idea of sustainable development. One is a focus on the relationships between humans and nature. It recognizes that fundamental conditions for life on our planet are sustained by physical and natural processes that are being interrupted by human activity. But if our biggest cities were to be measured with such a framework, it would be a bleak picture indeed. Another method that can measure sustainability directly is material flow analysis. This method measures the throughput of energy and materials through a city’s economic metabolism. It requires a tremendous amount of data and as a result is imprecise even at a national level, where it is most often attempted. Much of this kind of data can be captured in a city’s ecological footprint indicator – which we unsuccessfully tried to incorporate in this ranking. Ultimately neither of these approaches satisfies our definition of a sustainable city. We recognize that as centers of economic and cultural activity cities require constant external inputs in the form of food, energy and waste and pollution absorption capacity, and for that a certain proportion of land outside the city must be able to support a thriving metabolic metropolis. So we applied a third, broader approach to measuring sustainability – the three pillar model of society, environment and economy. The idea is that environmental sustainability on its own does not necessarily provide for a meaningful and prosperous existence for people. It somehow does not fulfill the whole purpose of our lives, otherwise we would not have built cities in the first place. This type of model recognizes that a minimum standard of living, a safe, secure social network and societal institutions support what we can term the good life that at the same time do not undermine the potential of future generations to live the good life themselves. So in a sense, that is what we are trying to measure. If it sounds like a lot, well it is, but we are not claiming to include every aspect of sustainability in this ranking. What we are left with after combining 27 indicators is itself just an indication of how cities perform relative to one another towards the Corporate Knights vision of a sustainable city; one that values ecological integrity, economic security, and social wellbeing equally; a city which looks to the future and promotes responsible corporate culture; a city which embraces its unique characteristic of diversity in the empowerment of minorities; a city which strives to maximize use while minimizing consumption, designing and building efficient infrastructure; promoting innovation in technology and governance alike. 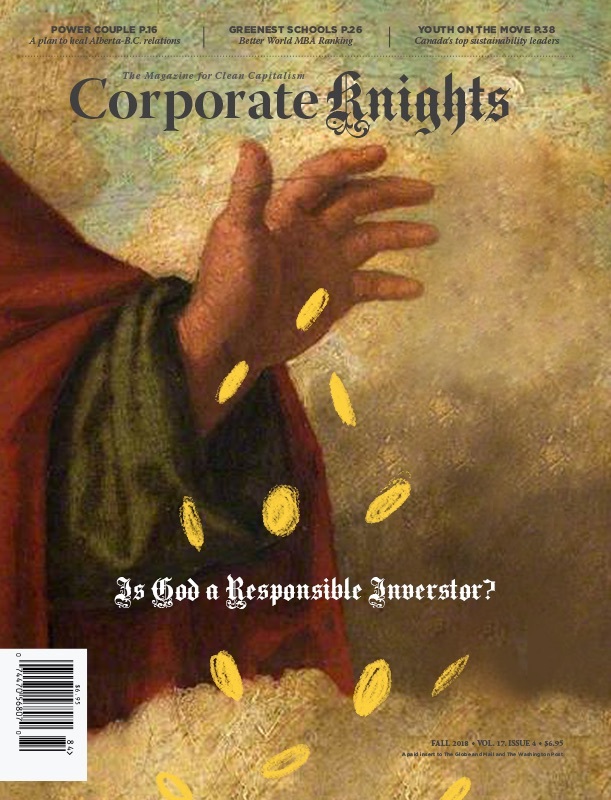 The Corporate Knights’ vision is a city of opportunities. We selected the following 15 US and 5 Canadian cities based on their metro and urban populations. Wanting to represent as much of the urban population of both countries, with an appropriate geographical balance we opted to represent Denver over that of San Diego in California or Austin in Texas given those states were already represented. Originally we hoped to compare urban areas covering a much larger population, given that these areas outside of city boundaries nevertheless are connected and form part of the socio-economic fabric. The lack of data at the level of urban areas made that impossible. Instead, this ranking relies on city level data as well as metropolitan statistical areas in the US, taken to be comparable to census metropolitan areas in Canada. 5 categories (environmental quality, economic security, governance and empowerment, infrastructure and energy, and social well being) were represented as equally as possible by the 27 indicators. Each category was comprised of between 4 and 6 indicators. The categories were kept very similar to previous CK rankings so that cities could be compared and progress monitored over time. However, because our focus was on comparing cities, the overall score of each city is based on a rank, not a score describing progress towards some desired goal. The rationale to use this set of indicators and not another was taken from the results of a 2010 review study by G.A. Tanguay et al, published in Ecological Indicators. The study reviews 17 other studies measuring urban sustainability and identifies 29 out of 188 indicators that are key predictors of aspects of sustainability. The 2013 version of the rankings attempted to include as many of these key measures as possible. Due to data access constraints for such a small geographical level as a city, we were unable to gather enough data on some of these key indicators such as ecological footprint and waterway quality. We did, however, include quantity of municipal solid waste generated, and rate of public participation in city affairs. The full list of indicators can be seen here. The raw city scores on various indicators cannot be compared because they use different units, and a few are subjective scores based on qualitative information. For each indicator category (such as Economic Security) all indicators are standardized on a scale of 0 – 10. This was done by subtracting the minimum score from every city score and dividing by the range in scores [(X – minimum score)/range]. 10 is automatically assigned to the top scoring city, and 0 to the lowest scoring city. This means every indicator has a range of 0-10 and no two cities can get the same score. Depending on the distribution of the raw scores, these standardized scores have uneven distributions, some centering around the low range of the scale, and some on the high range. Because these scores were not fitted to a normal distribution, the scores when averaged across a category are unintentionally skewed. For this reason we did not average the category scores and instead simply used the city rankings (from 1 – 20) added up across categories to come up with the overall results. Results – what do they mean? Keeping in mind what we are measuring, and how we stick to the rankings to calculate overall performance, the top performing city in the ranking can be said to be “the top performer on the 27 equally-weighed indicators when compared to all other cities measured.” We can say the top city has, on average, best met the sustainable city criteria that is presented in our vision of a sustainable city. We cannot make any conclusion about a city’s absolute performance, or whether it meets any standards or thresholds. For example, a top-performing city may still not meet an international standard to designate it as sustainable. But we can be sure that if the top city is lacking, the cities that follow will also be lacking. Our results and some of the indicators are similar (or actually the same) as a comprehensive “Green City” study done by Siemens in 2010. There are at least two major differences, in that the Siemens study focuses more on what would be considered environmental sustainability. It encompasses environmental, infrastructure and land use indicators well. This Corporate Knights ranking is broader and farther reaching – and as a result more difficult to interpret – than that. We cover indicators of economic security, well-being, and more specific indicators of green transport. Secondly, the Siemens study averages scores across categories to come up with a score out of 100 for each city. We refrain from doing this directly. The main limitations to these kinds of composite indicators are data access, availability and timeliness. For example, although the ecological footprint measurement would be an excellent indicator of sustainability in concrete terms, only a few cities have calculated this metric. Not all cities report GHG emissions at community and government levels. Canada’s census survey was last conducted in 2011, but as some areas have been discontinued we were forced to use older 2006 data for certain indicators, including water consumption. A major challenge in this project was comparability between Canada and US cities, especially in regards to economic statistics. Although both countries keep comprehensive statistics, they are measured differently in some instances and are difficult to compare as a result. For some economic indicators we could not compare data directly, but instead had to calculate the anomaly from the national average, and compare that number. Another limitation is that considerations were not made for geography and climate when energy and transportation needs may be very different between cities like Calgary and Los Angeles. On the other hand, our coverage of such a wide variety of city variables means that no one factor has a disproportionate weight on city performance, which also helps to cover the few data gaps present. Preference was given to international studies with city level data. Understandably, these were difficult to obtain and do not represent the majority of data gathered here. As in previous years, Statistics Canada was a major source of data, and this year the American Community Survey, as well as the Bureau of Labor Statistics in the US were heavily drawn upon. Another data source was the 2010 Siemens Green City Survey, and data for the environmental quality as well as infrastructure and energy categories makes use of this report. A major effort was made to retrieve direct information from city offices via a city survey. City mayors, environmental and sustainability offices were targeted to find a key contact with some cross departmental coordinating functions. The contact was then asked to fill out a survey asking for data that was either difficult to find elsewhere, or that would update and verify data that was found from publicly available sources. The response rate was 50%, and cities that completed the survey were given bonus scores that may have raised the rank they would have otherwise gotten. Low priority was given to media reports and municipal websites, but this data proved useful when no other compilation source was available. Several online databases were used as well. The Carbon Disclosure Project provided data on GHG emissions and targets. The Canadian Institute for Health Information (CIHI) provided numbers of licensed physicians in Canada. These databases were about as often used as compilation reports. Finally, academic studies and think-tank reports also contributed vital information to this project.